The house is set in a quiet urbanisation, close to plenty of shops, bars and restaurants yet only 20 mins from the centre of Cape Town City. Close by are the designer shops of Canal Walk and Ratanga Junction Theme Park. Blouberg beach, only a few minutes away, is famous for kite surfing and windsurfing and offers some exceptional restaurants where you can enjoy fine steaks, fresh fish, or just sipping cocktails with incredible views to Table Mountain. This area of Blouberg is very peaceful yet close to everything Cape Town has to offer. The master bedroom has a large en-suite bathroom, with a large walk-in shower and a corner bath with Jacuzzi where you can relax and look at the stars through the feature glass ceiling. The second bathroom which is bright and airy also has a separate shower and a full size bath. Comfortable lounge with 2 leather sofas, TV, Satellite and DVD/CD player. Coffee table and dining table with 6 chairs. Full kitchen equipped with oven, hob, washing machine, dish washer, microwave etc. All the necessary mod cons for a family holiday. There are 2 great golf courses within a short drive from the house. Notes on accommodation: There is a garden service twice a month keeping the lawns in and around the property in good condition, the pool is salt water chlorinated and Solar Heated. Around the house is a large wall therefore good security for children. The house is fully alarmed and has an automated double garage for full use of the guests. Outside: This property is very private with a walled garden, recently installed 8 metre solar heated swimming pool, patio with BBQ and table and chairs for 6 guests. Sun loungers and beach/pool towels are also for use of the guests. Very functional but a little "tired"
Very reasonably priced, nice area, but needs some updating. Nice pool. We were very happy here. However the house was perfect for us but really needs to have some tlc to bring it up to modern expectations. Linen needs to be updated especially. Debbie the agent was very helpful in all aspects. Thanks for your comments, we visit the house each year to try to keep everything up to scratch for our clients. We have just returned from our annual visit and agree that when we arrived it was looking a bit tired. We have now done a full revamp, painting, cleaning, repairing and replacing, such as coffee table, lamps, bed linen , cushions, etc... I hope that if you book with us again you will see a huge difference! Schönes Haus mit warmen Pool. Gut gelegen für Besichtigungen der Sehenswürdigkeiten von Kapstadt. Less than 5 minutes drive away is Blouberg Beach, famous for its long stretch of white sand and a kite surfing hotspot! This beachfront boasts some fantastic bars & restaurants that suits everyone’s tastes. Steak houses, Fish restaurants, Italian and Chinese cuisine also some great international bars and night spots. 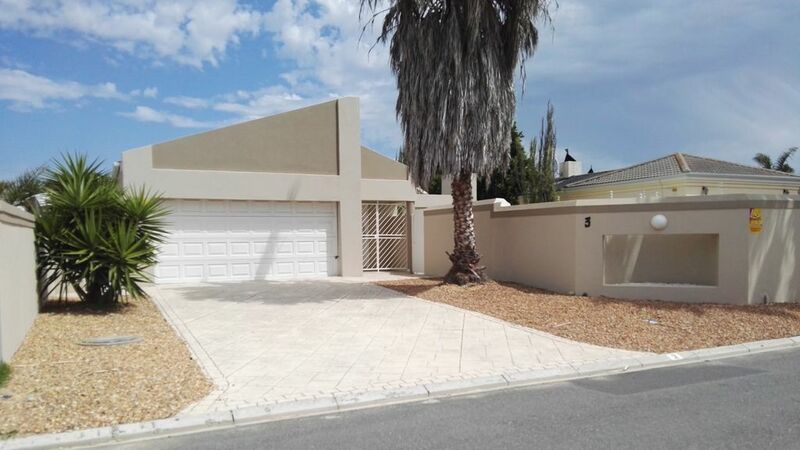 The house is only 20 minutes drive from Cape Town International airport, with plenty of shops close by, the City Centre is easy to get to although a car is recommended. Cape Town City centre and the Victoria & Alfred waterfront is approximately 15 minutes away by car, also the Wold Cup Stadium at Green Point. Camps bay and Clifton Beach are a further 5-10 minutes away. Canal Walk shopping centre and Ratanga Junction theme park are also easily reached within 15 minutes drive inland. Booking Notes: Please enquire. Changeover Day: Please enquire. Notes on prices: Prices include: Electric, Water, Garden service, Pool Service, Clean towels & linen. Discounts are available for stays of 21 days or more. £50 cleaning fee on each stay.